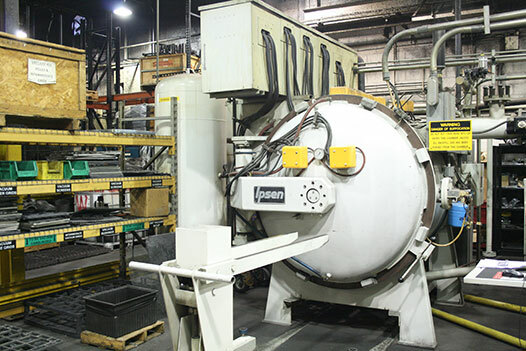 While there is no such thing as a perfect quenching medium and there are always trade-offs to be made, quenching oil for heat treating is a popular choice due to its versatility and the wide array of benefits that it offers. Read on to learn more about the types of heat treat oil Superior Steel Treating uses and how oil can yield some of the best results. Different types of oil used in quenching can yield different results, and the type of oil used depends in part upon the type of metal being heat treated. Some oils control distortion and reduce the risk of cracking of a highly hardenable alloy by ensuring that there is not much variation between the surface temperature and the core temperature during a quench. These oils are called hot oils because they are kept at much higher temperatures. Fast oils are used typically used on low-hardenability alloys and low-carbon steel and are so called because they have specific properties that cool items more quickly by altering the length of the different stages of the cooling process. The process of quenching heat treated metal consists of three stages. The shortest stage is the boiling stage, which comes after the vapor stage and before the convection stage. In the initial vapor blanket stage, the hot metal is submerged into the quenching oil. The temperature difference between the hot metal and the cool liquid causes the oil to vaporize. Cooling of the metal is impeded by the vapors that surround the metal, like a blanket, and prevent heat transfer. The oil is boiled in the second stage, causing the vapor blanket to dissipate and allowing heat energy to transfer from the metal to the oil. Once the oil reaches its boiling point, heat energy dissipates during the convection stage. Oil is preferable to the traditional quenching medium of water because it reduces the risks of distortions or cracking by cooling metals more evenly and more quickly. Specialty Steel Treating offers several quenching options. Call 586-293-5355 to find out more.